� James Earl Ray accelerated Martin Luther King�s place in American History. We have a Martin Luther King holiday and most cities have a Martin Luther King St or Avenue. 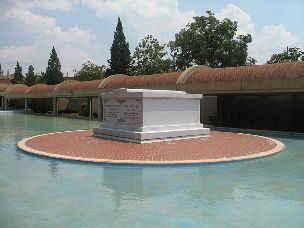 Reverend King is now memorialized on the National Mall in Washington. His non-violence approach is remembered although often not followed. Martin Luther King occupies a special place in American History. On our next visit to Washington, D. C., we want to see the M L King Memorial on the National Mall. As most AVOC readers know by now, we are interested in History. Historic sites, Presidential Libraries, Memorials, and Museums etc are sites of many of our visits over the years. Often it is like reliving history, especially for Betty and me. Jennifer, as a Social Studies teacher, is vey interested and informed on history. While in Memphis, we visited the Lorraine Motel, site of the assassination of Martin Luther King on April 4, 1968. The site is now also home to the National Civil Rights Museum. We had previously visited Ebenezer Baptist Church in Atlanta and the King Historic Memorial Site in Atlanta. Betty and I lived through the Martin Luther King era. We have many memories of news casts, demonstrations, assassinations and lengthy television coverage. As often happens in life, one does not always realize the historic significance of events as they are occurring. We knew of the controversy surrounding King in the early years. It was a national tragedy when he was killed. Many Southerners have come to appreciate his non-violent approach to change. Not all people associated with him have strictly followed that approach. James Earl Ray was the shooter and was eventually caught, convicted and sentenced to life in Prison where he died on April 23, 1998. Ray was not a hero to most of us and his hostile act elevated Martin Luther King to martyr status immediately. The dastardly act of James Earl Ray accelerated Martin Luther King’s place in American History. We have a Martin Luther King holiday and most cities have a Martin Luther King St or Avenue. 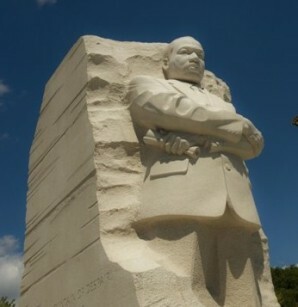 Reverend King is now memorialized on the National Mall in Washington. His non-violence approach is remembered although often not followed. Martin Luther King occupies a special place in American History. On our next visit to Washington, D. C., we want to see the M L King Memorial on the National Mall.